Southwest Medical Center is pleased to announce the arrival of hospitalist program physician assistant, Unnati Basnyat, PA-C. Basnyat is the fourth physician assistant to join the hospitalist team, which provides care for patients admitted to the regional healthcare facility. 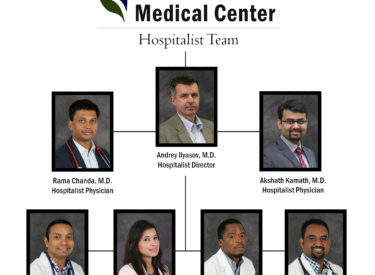 Southwest Medical Center’s hospitalist program, implemented in 2014, is led by Andrey Ilyasov, M.D. Ilyasov is joined by Rama Chanda, M.D. and Akshath Kamath, M.D., who work hand-in-hand with patients’ primary care providers to care for patients during their hospitalization. Hospitalist programs are a growing trend in hospitals across the United States, as the service offers benefits to both patients and physicians. Hospitalist director, Dr. Ilyasov, says the program benefits not only the patients and physicians in Liberal, but those in surrounding communities as well. The increase in utilization of the hospitalist program has resulted in the growing need for more providers over time. In addition to hospitalist physicians, Southwest Medical Center has hired four certified physician assistants during to past two years to assist in caring for patients.